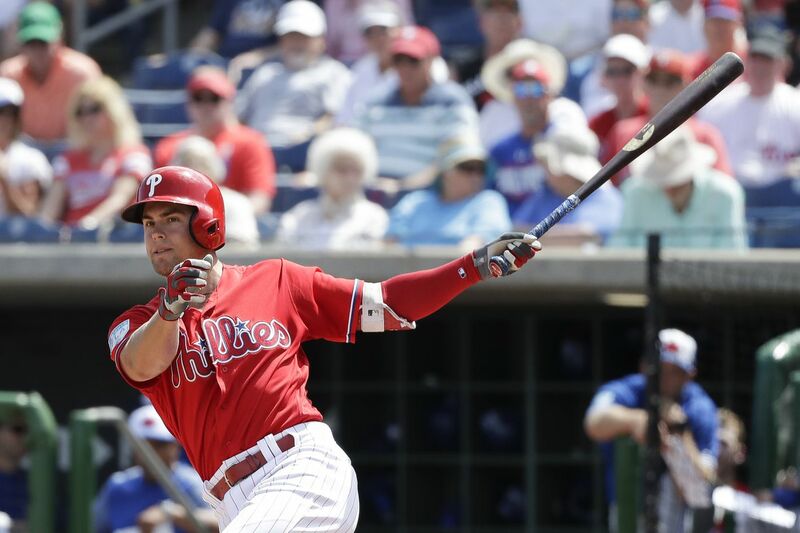 With a lineup that figures to be more static this season, the Phillies will need to find ways to get at-bats for utilityman Scott Kingery. TAMPA, Fla. -- Aaron Judge and Scott Kingery make an odd couple. Judge is a behemoth, 6-foot-7 and 282 pounds, with the brute strength to match. Kingery is 5-foot-10 and needed two-a-day workouts and an all-you-can-eat diet in the offseason to get over 190 pounds. But for several weeks this winter, the Yankees slugger and the Phillies utilityman were nearly inseparable. Judge and Kingery are represented by the same agent and have trained together in Southern California for the last few winters. But although Judge is one of baseball’s biggest stars and plays in the country’s largest market, it is Kingery who on Monday will mark the one-year anniversary of signing a six-year, $24 million contract despite not having a set position. It’s conceivable that Kingery could still be the Phillies’ opening-day third baseman. Manager Gabe Kapler has kept the door open to that possibility. Kingery is more versatile than incumbent third baseman Maikel Franco. He’s also faster and a better defender and, therefore, figures to be a bigger asset off the bench. Besides, after ranking among the worst hitters in the majors as a rookie last season, the speedy 24-year-old has not earned his way into the lineup every day. Give him time, though, said Judge, who believes Kingery needs only an opportunity to play. "What I saw from Scott this past offseason was hunger," Judge said. "He was putting the work in the cage with me late. I saw a young player who was like, 'I didn't like what happened last year, and I'm not going to let it happen again.' When you have a guy who has the talent but also has the want and the hunger like that, it's a rare combo." But if Franco begins the season as the everyday third baseman and plays well enough to keep the job, it won't be easy for Kingery to crack the rebuilt lineup. Barring injuries, the Phillies have seven players (infielders Rhys Hoskins, Cesar Hernandez, and Jean Segura, outfielders Andrew McCutchen, Odubel Herrera, and Bryce Harper, and catcher J.T. Realmuto) who typically play 150 games per season. Finding playing time for Kingery could prove to be one of manager Kapler’s biggest challenges. "The reason it's a challenge it because we want to see him on the field all the time," Kapler said. "We want to see him at some position every night. We love having him in the lineup and on the bases." Kingery has spent most of his time this spring at third base, after playing only 10 games there last year. His biggest adjustment has been the shorter reaction time at the position. But he made a stellar play in the first inning Friday night against the Yankees, leaping to snare Luke Voit’s missile that seemed sure to land in left field. At the plate, Kingery came to camp pledging to be more aggressive. In 484 plate appearances last season, he got ahead in the count only 116 times, sixth fewest in the majors. He dropped into an 0-2 count 76 times, sixth most in baseball. It's little wonder that his .605 on-base plus slugging percentage ranked 209th among 214 players who got at least 400 plate appearances last season. Judge understands what it's like to feel so lost. After getting called up by the Yankees late in the 2016 season, he went 15-for-84 with 42 strikeouts and only nine walks in 27 games and looked overmatched by major-league pitching. Three years later, it's easy to forget those struggles. Kingery is 12-for-48 (.250) with two homers and 16 strikeouts this spring. Friday night offered encouragement. Kingery homered against Yankees starter Jonathan Loaisiga, drew two walks, and worked a long at-bat leading off the game that resulted in a strikeout but was followed by a solo homer by Odubel Herrera. Judge couldn't say he was surprised.